HPC Blog On the HPCG side of the house, Purdue/NEU reigned supreme with their score of 1,394.32. They foiled FAU's plans for a HPC benchmark sweep by topping the Germans by a comfortable margin. Beihang and EPCC took the third and fourth place respectively. HPCG is a benchmark that's hard on both the students and the systems. It's designed to be more of a real-world benchmark that more closely matches the computational and data access patterns in HPC applications today. It includes Sparse Matrix-Vector Multiplication, Local Symmetric Gauss-Seidel smoother (including sparse triangular solving exercise), and is driven by a multigrid preconditioned conjugant gradient algorithm to top it off. Ask me to explain all of this sometime and watch me squirm. All I know is that it will make your machine sweat silicon when you're running it – and that's what we're looking for in a good benchmark. 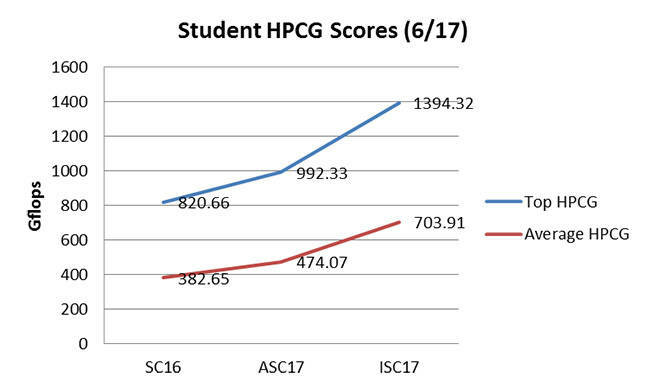 HPCG has only been a part of the competition for a few years and it has taken a while for the students to get its measure. 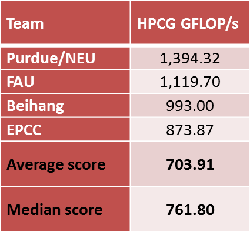 As you can see, the median score is significantly higher than the average score, meaning that most of the teams scored much lower on HPCG – pulling down the mean.